Yesterday we were discussing the early life of Sri Hanuman. He was given benedictions by the most powerful deputed agents of the Supreme Lord within the universe. One of those benedictions was when he came to the age to study, Surya, the predominating Lord of the Sun planet would teach him all of the Vedas, all of the sciences and all the subjects necessary to empower him in his devotional service. In the Gayatri Mantra that Brahmans chant three times during the sandhya every day, there is a meditation upon and worship of Suryanarayan, Krishna who was the very source and power of the sun. Krishna is like light and maya is darkness. In the presence of Krishna darkness cannot exist. In the Bhagavad Gita, Krishna compares ignorance to darkness and transcendental knowledge to light. When we understand who we really are, the eternal soul, we understand jiva tattva and Krishna tattva, the Supreme Absolute Truth, the Personality of Godhead, the source of everything that exists, and our relationship, Bhakti Tattva, that we are the eternal servants of the Lord. To love Krishna, to serve Krishna according to Krishna’s will is the true dharma of the soul, it is Sanatan Dharma. And this maya tattva or the truths about illusory energy and the prakriti or material nature, when that light of this knowledge is revealed to us than we can see everything as it is. We see that everyone is a part of Krishna. He is the supreme mother and father of everyone. People in this world who have riches, who have beauty, fame, strengths, health but do not have pure bhakti, they are the objects of compassion for those who do. Why should we spend this valuable rare human life chasing after things that are going to be stripped away from us very soon? The human birth is the opportunity to find the true pleasure,the real wealth of eternal happiness and to share that happiness with others. This is the nature of a person who has seen the light. He becomes humble by that light, there is no question of false ego. Selfishness, the incessant craving to be recognized, pratishtha, the desire for recognition, fame – it’s the mind’s way of succumbing to the ego. It’s the symptom of the person who has really not tasted the sweetness of glorifying Krishna, who is all attractive, who is Bhagvan. Krishna is the Supreme whole and the origin of all knowledge, strength, wealth, fame, beauty and renunciation. Hanumanji, he asked for the same benediction. “As long as creation is here, as long as your name is being chanted and your glories are being discussed Lord Rama, let me be here to serve those people.” Hanuman himself, it’s quiet extraordinary, we find in Ramayan, he was really in the spirit of being the servant of the servant. Even when he went to Srilanka, he didn’t get that order directly from Ram. He got it from Sugriva, and when he jumped across the ocean he got the instruction from Jambavan. In our own sampradaya, the most elevated of the acharyas, the Prayojana Acharya Raghunathdas Goswami, he was so close to Sri Chaitanaya Mahaprabhu but yet all instructions that he was receiving was through Swarupa Damodar Goswami. How the greatest personalities want to be the servant of the servant of the servant and how the lowest and the smallest personalities want to be the master. Knowledge brings this light to our life where we understand what is of true value and what isn’t. So to great personalities, they are most happy by seeing our enthusiasm to make spiritual progress. 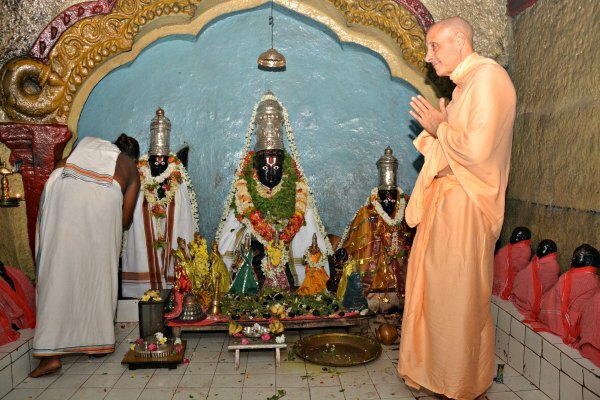 Srimad Bhagvatam, what was it that Sukudeva Goswami wanted? He didn’t even wear clothes, he never lived in a house his whole life, he just wandered the forest completely immersed in hearing and chanting and remembering the glories of the Lord. When he was speaking on the bank of Ganga to Parikshit Marahaj, again and again he would speak from Sriamad Bhagvatam especially from the tenth canto. 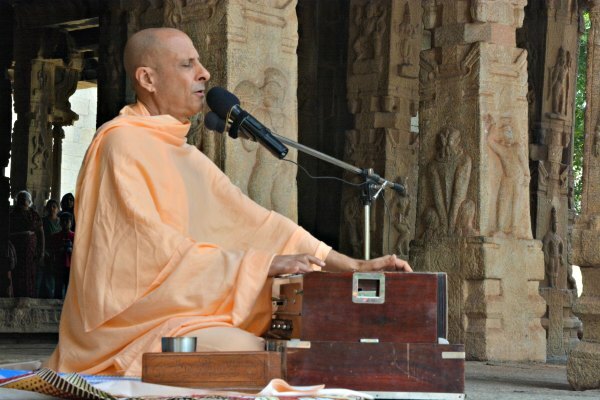 He glorifies Parikshit, because he was so enthusiastic to hear. ‘Your enthusiasm to hear is empowering me to speak.’ When we actually understand that we are instruments of grace, not holder of grace but instruments of grace, nothing is ours, but the opportunity to serve. When people are eager to hear instead of being proud that we can speak nicely, we actually are grateful. So Surya was so happy because Hanuman was so eager to learn. He said, “ That has completed made me satisfied.” Hanuman insisted he wanted to give him something more. Surya, he said, “My son, who is an expansion of myself, is Sugriva, the son of Vriksharaj and the brother of Bali. Be his friend, be his protector. In every situation in life be at his side.” Hanumanji made that promise. So Sri Hanumanji came to Kishkinda Kshetra and there he became the dear friend and minister of Sugriva. So Bharat returned to Ayodhya. Ram and Sita, Laxman lived in Chitrakut. Ultimately they entered the Dandakaranya Forest. And in the holy place of Panchavati, Ravana stole Sita away while Ram and Laxman were chasing after the golden dear. When Ram returned and found Sita gone, he was searching everywhere. In his search he came across Jatayu, a great devotee and a dear friend of Maharaj Dasrath, who was very old. Even though Jatayu understood he didn’t have a chance of saving Sita, he was not willing to live and see the injustice happening in front of him. And with all the power and all the force within him, he fought against Ravana. Ultimately his wings were cut and he lay there bleeding as Sita embraced him crying in gratitude; he gave his life for her. Ram was so grateful to Jatayu; on that very day he sent him back home back to Godhead, to Vaikuntha. He was willing to suffer and die for his devotee. Ram and Laxman in separation of Sita traversed hundreds and hundreds of miles and eventually they came upon one enormous monster personality; his name was Kabandha. His body was as big as mountain. His arms were eight miles long. He had one eye in the middle of his chest and he had a massive mouth that was in the place of his stomach and he was roaring. Not like that! And with his arms he was taking handfuls of elephants and tigers and all sorts of buffaloes and just devouring in his mouth constantly. He grabbed with one hand Laxman and with one hand Ram, and eventually they cut his arms off. Kabandha, he told Ram and Laxman, “Dig a hole and burn my body.” They did and a beautiful demigod, a celestial being came out of the smoke. And he explained he actually was a beautiful demigod with incredible intelligence and very beautiful bodily features, enormous wealth, but he was proud. And there was a sage who kind of looked ugly, so he made fun of him and it was due to his false pride. Kabandha explained – pages and pages of Valmiki Ramayan – the beauty of Pampa Sarovar, the types of trees and flowers, fruits, the birds, varieties of birds and the songs that they sing. “And it is there at the Rishimukhya Mountain close to Pampa Sarovar that the great sage Matanga Rishi was living with his disciples and one of his disciples, an old lady from an outcaste family named Sabri, is still waiting there. Her Guru Matanga Rishi took all the disciples back to the spiritual world, but told her to wait for you, to serve you.” Offering his pranams to Ram, Kabandha in his celestial form went back to heavenly world. Then Ram and Laxman came to Pampa Sarovar. There he saw some caves on the banks of the lake and a little straw hut. Then sitting on the ground on a little kusha grass mat was an old emaciated lady Sabri. She was wearing just a bark of tress, her hair was matted, she was constantly with tears in her eyes chanting the holy names of the Lord. When she saw Ram and Laxman, she immediately recognized them, because by the grace of her guru, she was meditating on Ram coming for many, many years with such anticipation, eagerness. Srila Rupa Goswami, he tells that the price of Krishna consciousness is this eagerness. And to cultivate this feeling of separation makes us very, very eager. Sri Chaitanya Mahaprabhu. Feeling your separation Govinda, the whole world is like a dreary void and each moment is like a yuga. But in that eagerness of separation, how much intensely he was chanting the holy names of the Lord, how intensely he was eager to serve the Lord! Sabri had such faith in her guru. She knew that Ram would come. Years and years and years passed and she sat there just doing her meditation and doing her seva and now the fruit of all of her prayers, of all of her sadhana, had manifested. She had a chance to personally serve the Supreme Personality of Godhead. After offering her dandavat pranam, she offered him a sitting place and offered him prayers and gathered some of the forest fruits to satisfy Ram and Laxman. According to the story that we often hear, there was a particular fruit, whether its ripe or unripe is impossible to tell by seeing it or touching it. You can only understand if you taste it. If it’s unripe it’s bitter. If it’s ripe it’s sweet. So in her enthusiasm to serve Ram, she will take each little fruit and take a bite of that and if it was bitter, she would put it aside for her to eat later and if it was sweet she took it out of her mouth and present it to Ram. Now according to the standards of deity worship, this is very offensive, but because of her love Lord Ramchandra accepted the saliva of her mouth as the sweetest part of the fruit. Krishna tells that, “Fruit, flower, water, even a leaf, if it’s offered with love I will accept it.” It is the love that makes everything sweet for Krishna. She was so poor, she did not have nice plates, she didn’t have nice house, she didn’t have nice food, but she had love. And for Ram and Laxman they were completely satisfied with her love and she told her whole story to Ram. 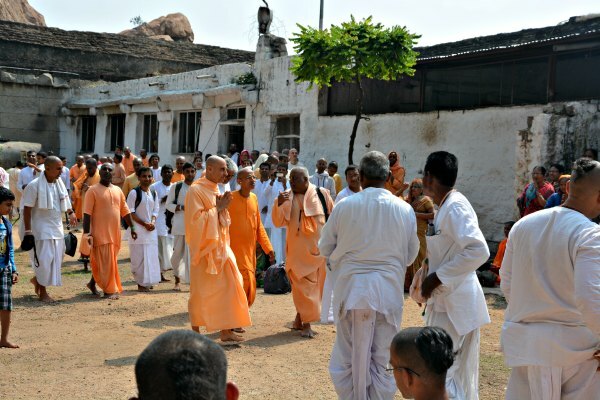 Ram wanted to see what did the ashram of Matanga Rishi looks like. So Sabri gave him a tour. 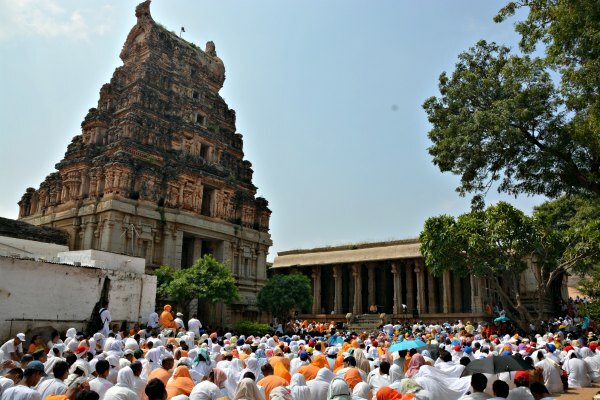 Laxman and Ram were walking beside her and she showed them that this is where they performed their yagnas – because in tretayuga yagna was the yuga dharma – and it was still burning even though over a decade had passed since they left. She said, “These are the flowers that they made into the garlands to decorate their beloved Lord.” And the garlands were still fresh and fragrant. She said, “All the sages they just wore tree barks and here is the place where after washing their clothes they would dry them,” and there were tree bark hanging and they were still wet from being washed. Because of their love and their devotion to Ram, everything was still fresh as it was years and years before when they left it, just so that Ram could see it. Lord Ram and Laxman were so happy by the simplicity of Sabri. And Lord Ramchandra, he told Sabari, “You have satisfied me by the simplicity of your love and devotion. Now you can go and join your guru again and all of your god brothers and god sisters.” By his grace Sabari understood that her life was perfect and she in meditation, she sat in the sacred fire. Suddenly she was consumed by the fire, but she had such faith that a moment later she had a spiritual body and she came out from flames. She was no longer emaciated with matted hair. She had a heavenly celestial body with such beauty, gowned with such elegance. And then with the permission of Ram and Laxman she returned to join her guru in the loving service of the Lord, which was her only desire. You see, when Ram came to her, Sabari, her joy was not in seeing Ram; her joy was in serving Ram. ‘Don’t try to see Krishna; try to serve Krishna so that he is happy to see you.’ Yes, she was seeing the Supreme Absolute Truth, the personality of Godhead face to face, but her joy was in serving him and in pleasing him. Ram and Laxman were walking in this beautiful area of Pampa Sarovar. They were seeing the trees and the fragrances of flowers – so intoxicating – and all the animals they were seeing were so happy. The birds were singing, the peacocks were calling for the peahens and the peahens were calling for peacocks. And seeing this environment which was so enjoyable, Lord Sri Ramchandra could only remember Sita. “In this most beautiful most enjoyable heavenly place how can I be happy without sharing it with my beloved Sita?” This is the nature of the love. And Ram was seeing Sita in everything, when he was hearing the sweet birds singing and when he was smelling the sweetness of the flower’s fragrances and the beauty of pampa sarovar in the forest. He was only thinking how he wanted to share this with Sita and his heart was breaking. Laxman told the whole story to Hanuman, about the beautiful city of Ayodhaya, about the intentions of Kaikei, their exile, their beautiful life in Chitrakuta with the sages and the rishis. He told about the abduction of Sita and how Kabandha that celestial being has informed us that we should make alliance with your master Sugriva to find Sita. Hanuman was so happy, he said, “Today there will be unbreakable friendship between the two of you. Get on my back and I will take you there.” So Ram went on one shoulder of Hanuman and Laxman went on the other shoulder. Hanumanji, he jumped to the top of Rishimukhya Mountain and within seconds he put Ram and Laxman down in front of Sugriva. They spoke together. Sugriva explained his situation, the pain of his heart. He said, “My brother Bali has stolen my wife Ruma. He banished me from his kingdom and he is constantly looking to kill me.” Ram promised, “I will restore your wife and kingdom.” Sugriva said, “I promise, I will bring back Sita.” They held hands and then Ram lovingly embraced Sugriva. And seeing this Hanuman was so happy – the embrace of Ram and Sugriva – that immediately Hanuman started a sacred fire. Hanuman was expert at everything. He learnt singing from Saraswati. No one could sing like him and he knew every type of instrument perfectly. 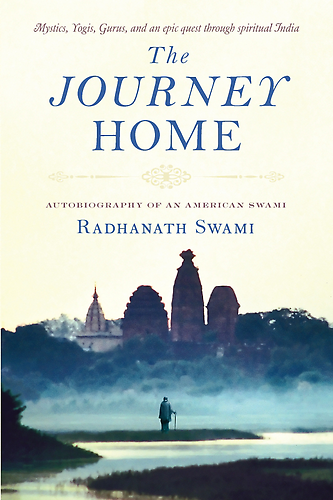 He could recite poetry; he knew sastras by memory. His dancing, his heroic deeds, his yogic asanas, his mastery over medicine and his brahminical duties of performing yagnas, Hanuman was expert at everything. Not simply because he was trained in all these ways, he was blessed by Brahaspati the guru of the demigods to have the same knowledge as him. Everything known by Surya, the Sun god was shared with them. All the beautiful music and poetry talents of Saraswati were given to him and the heroic powers of Indra and Vayu and Shiva were all at the disposal of Hanuman. He explained that Vriksharaj was the king of monkeys. And he had two sons; one was the expansion of Indra, Bali, and other was the expansion of Surya, who was Sugriva. Bali was the elder brother and both Sugriva and Vriksharaj, they had such honor and respect for Bali’s incredible powers. After Vriksharaj retired and left this world, Bali became the King. He was so powerful. He (Sugriva) explained some of his powers. He said that Bali, he would go to all four oceans every day. He would go to the Southern Ocean and chant his sandhya, his Gayantri mantra, then he would jump the same morning to the Eastern ocean and do his Gayatri mantra, then to the Western ocean and then to the Northern ocean. Now these oceans are tens and thousands of miles away from each other, but he would do that just as part of his morning every day. And one day Ravana attacked Bali, because Ravana was looking for someone to fight with and he had heard how powerful Bali was. So he challenged Bali. Bali was doing his Gayatri in ocean. Bali just grabbed Ravana and put him under his arm and just held him there. And Ravana’s arms were coming out on one side and his legs were on another, but his face was under Bali’s arms. Bali just effortlessly just kept him there and Ravana with all his powers just couldn’t get out. But for Bali, he still had three more oceans to go to and bathe. So he jumped to the Eastern ocean, jumped to the Western ocean, jumped to the Northern ocean, jumped back to the Southern ocean, did his Gayantri mantra, took his baths and all the while Ravana was trapped under his arm; not a nice place to keep somebody. Ultimately, like you would deal with just a little insect, he just let go of Ravana and said, “Ok. Now what do you want?” And Ravana said, “You are very powerful. You are very strong. I cannot even conceive of you.” And he praised him and he said, “We should be allies. We should be friends. We should defend each other.” Bali said, “All right, we will do.” Bali was so powerful. So this Mayavi came to attack Kirshkinda and he insulted Bali. And Bali was… he didn’t like to be insulted. So he went and attacked Mayavi, gigantic enormous person. They were fighting and fighting and fighting and ultimately Bali was pulverizing this demon, and he ran away. Then Bali ran after him with Sugriva, and they ran and they ran and they ran and Mayavi ran into a cave, a deep cave. Bali told Sugriva, “You wait outside here. I am going in.” Sugriva said, “No. No. I will go in with you, I am your brother. I am your faithful servant. I will do anything for you. I will fight with you.” Bali said, “No, you wait out here and if I win the fight then we will go down together, back to Kishkinda. But if I lose then you should seal the cave with a massive rock so that this demon Mayavi could not get out.” So Sugriva waited for a long time. They were fighting and fighting and fighting and he could hear the fighting happening. Suddenly he heard a massive roar and then blood was flowing out of the front of the cave. Sugriva did not hear Bali’s voice. He only heard Mayavi’s voice. So he was thinking, “My brother, my lord is dead.” Sugriva was absolutely broken hearted. He was weeping, he was crying and he took a gigantic rock and sealed the cave. He went back to Kishkinda and told to everyone, “Our king Bali is dead.” Tara, Bali’s wife was weeping; Angada, Bali’s son was weeping; everyone was weeping, and more than everyone Sugriva was weeping. He loved his brother; he was totally faithful to him. He had no aspiration but to serve him and assist him. The ministers told Sugriva, “You have to be the king, you are his younger brother.” Sugriva said, “No. How could I take the throne of Bali!” They said, “It’s an emergency. Our dynasty cannot survive without a king.” They literally ordered him to be coroneted, and as broken hearted and separation from his beloved brother as he was, he accepted. And now he was living as the king of Kishkinda. After sometime Bali – it took him a while to move that rock – and he came down to his kingdom and saw Sugriva sitting on his throne. He was wild with fury: my brother, he tried to kill me by sealing me in the cave just so that he could take my wife, could take my throne, and could take all my power and property to be his own; see how greedy, see how envious he is! Bali was so much in anger, he roared and attacked Sugriva. Sugriva was shocked. He was so happy to see Bali was still alive, but he was so sad to see that he was so angry. He said, “Bali, I am so happy that you are alive. I though you are dead. I was crying for weeks for you.” Bali came to kill him. Sugriva said, “I will give you the throne back, I will give you everything back, I will serve you just like before. I didn’t mean this; it’s a misunderstanding.” But Bali, his passions were so high. Sugriva was innocent. He had good motives. He only wanted to serve but he was totally misunderstood, and Bali was determined to kill him. They were fighting, but Sugriva was no match; so he ran. He had to run away and he remembered. Sugriva was telling Ram this story that there was one place in the world where Bali could not go. There was a monstrous asura named Dundabhi who took a massive form like a giant demoniac buffalo. He went to the god of the ocean and said, “I want to fight with you.” He said, “No, No, you win.” He went to all these different demigods; nobody would fight with him. Finally they all said, “You go to Bali if you want a good fight. He is the one to fight.” So he came to Kishkinda and they fought. Sugriva was explaining what kind of fight it was. Ultimately they fought for so many hours and hours and hours and finally Bali just grabbed him by his horns and threw him on the ground and punched him and punched him and punched him and picked him up and whirled him around and then threw him down again and punched him and kicked him and jumped on him with his knees and Dundabhi was dead. And he was so enthusiastic, he whirled around his dead body and threw him eight miles and it landed in Matanga Rishi’s ashram. And large quantities of this demon’s blood splattered everywhere and kind of on sages bodies and desecrated their yagnas. And Matanga rishi was not happy. He said, “I curse, if that monkey that threw this demon’s body and made everything in my ashram impure by blood, if he ever comes within a four miles of radius of my ashram, he will turn into stone.” So Bali heard that and he was travelling the whole world but he would never come to Rishimukhya Mountain. Sugriva was running around the world trying to escape from Bali’s wrath, but he ultimately took shelter of Rishimukhya Mountain. And Hanuman who promised to his father Surya that, “I will always be by his side to protect him as a friend, no matter what happens,” he was always there, willing to accept exile, to be with Sugriva. Ram said, “Let us go. I will slay Bali, give you back your wife and the kingdom you deserve.” Sugriva said, “I know, I know your faith and your word of honor is more precious than anything in creation. But still I am afraid. I have seen Bali’s power.” Laxman said, “What does Ram have to do to prove his power?” He took Ram to Dundabhi’s bones. It was like mountain. Just a skeleton, it weighed thousands of tons. He said, “Bali picked him up and threw him. Can you pick him up Ram?” And Ram with one toe of one foot effortlessly kicked this skeleton and the skeleton flew 80 miles away. But Sugriva was so terrorized by Bali, he said, “Well, you know when Bali did it, he had flesh, he had fat, he had muscles. You just did the skeleton, but do you see these Sal trees?” There were seven Sal trees in a row, each of them with a width of 30 human arms; and this is Tretayuda, would not cover the width of these trees. He said and these sal trees are extremely dense and strong. He said, “Bali used to uproot them and snap them. If you can shoot an arrow through one of these trees, I can understand that you can conquer my brother.” Ram smiled and he took out an arrow and chanted a special mantra. The arrow went flying. He shot that one arrow. It went through one tree, another tree, another tree. It went through all seven trees and then that arrow after piercing though all the seven trees, it went down into the earth, went to the very bottom of the center of the earth, went to patal loka, then it came out again and went to the air like blazing fire and entered once again into Ram’s quiver. Sugriva was convinced. “I will go back and challenge.” Such faith! Sugriva comes down; he is already beaten and exhausted; he rested a little and he came down some hours later and he started roaring, “Bali, I challenge. You are a coward, you have stolen, you are immoral, you are worst person.” He just started saying terrible things about Bali. Bali, even more angry, and he was about to rush out and fight and kill. And Tara, Bali’s wife, she said, “There is something wrong. You should not go.” Bali said, “Get out of my way.” She stood in front of him and said, “Do not go; there is something wrong here. You just defeated him; he was on the verge of death. Why would he come back to fight with you again with such confidence? I have heard that there are two princes, the sons of Dasrath, who have made alliance with him. They are there to help him; they will kill you. You have done so many immoral things. Your destiny will be to die if you go out there to try to fight him. Just stay here.” But Bali was so much upset. His anger and his ego was so big. He told Tara, “I know I am in no danger. You don’t know what you are talking about. Get out of my way. I am going.” And he rushed out and he grabbed Sugriva and he started fighting and fighting and fighting and ultimately Bali defeated Sugriva, and Sugriva was lying on the ground helplessly. And Bali picked up – his knees were on Sugriva’s defeated Bali – and then with his hands clenched together, he lifts both of his hands up above his head to pound it down and to give the death blow to Sugriva. Meanwhile Ramchandra was behind the leaves of some tree, watching. And just as Bali raised his arms to smash that down with final death blow, Ram let loose an arrow. His bow, he shot it with such force that it sounded like a thunder. And it hit the chest of Bali and pierced his heart. Bali’s body was so strong and so hard and so full of power that it… when it hit and penetrated the body of Bali, it was like a thunder that shook the entire earth. Blood came and Bali fell down. He was lying there, he didn’t know what happened. Sri Ram came before him. Bali was very disturbed. He said, “Why did you do that? What kind of dharma is this? Why didn’t you fight me face to face? Why you were hiding behind trees so I could not even see you when you killed me from that position? This is not the activity of a Kshatriya; this is the activity of a cowherd. If you wanted Sita back, why didn’t you make alliance with me? I could have defeated Ravana.” Ram replied, “You are speaking of adharma, actions against dharma.” He said, “I am simply an instrument of your own destiny. Where was your talk about dharma when you created such havoc and cruelty to your brother’s life? Sugriva was the most faithful servant you ever had; he loved you, he served you. You made him live in fear. You banished him to live in a mountain and you tortured him by taking his wife as your own because of your arrogance, because of your cruelty. This was your karmic destiny, but because you will die from my arrow, you will be liberated of all your karma and you will attain my abode. And besides that I am a Kshatriya and you are in a body of a monkey. In this way Bali needed that arrow on his chest to be sober enough to hear these teachings and he accepted it and with tears of love and gratitude, he bowed down to Ram. He said, “Everything you say is true. This is my destiny that you have given me and I am grateful to you.” At that time Tara, Bali’s wife, hearing what had happened she came running out to be with her husband. And some of the monkeys who were Bali’s associates, they stopped her and said, “We have to escape because now Sugriva is going to be the king. And because we have persecuted him for all these years, he is going to destroy us. What to speak of what he might do to you and to your son, take him away.” Tara ran to the side of her husband and Angad came to his father Bali’s side. They were weeping and crying and Tara spoke. She spoke to Bali who was still barely breathing. Ram spoke to Tara. He said that the soul is eternal, for the soul there is neither birth nor death. The physical body is subjected to birth, growth, sustenance, old, deterioration, old age, disease and ultimately death. For the embodied being death is certain and re- birth is certain. Sugriva was pacified and Ram promised Angada all protection for the eternal soul of his father, for his mother and for him. There was a royal funeral. They brought a wood palanquin and put jewels and silks and everything ornate on it and they carried Bali. It was incredible event with such feeling and such love for everyone. And after the chanting of the mantras and offering of heartfelt prayers, Angad circumambulated the body of his father and lit it on fire. Ram told Laxman and Hanuman, “Now you should coronate Sugriva as the king of Kishkinda.” Then Hanuman did. Why didn’t Ram perform this ceremony? Because Ram would not enter into the city of Kishkinda even though it was a jungle city. 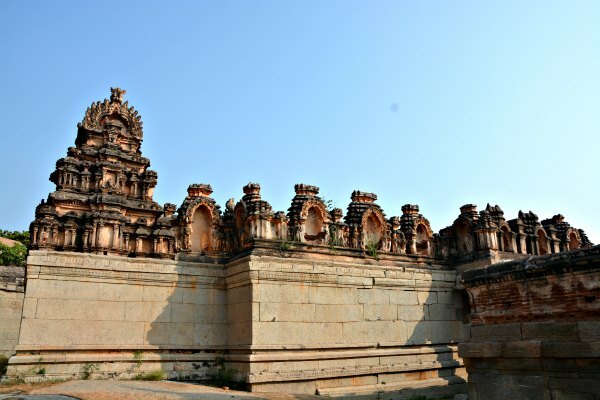 He said, “When I was exiled, I made a promise that I would not enter any habited city or village.” So there is a place on the banks of Tungabhadra river where you will be going, and it was in this place where Hanumanji and Laxman coroneted Sugriva as the king. During the four months of the rainy season, which actually includes now, even though it’s not raining, Ram was living right here in a cave. From the mouth of the cave Ram and Laxman would look out and see the lightning and thunder and torrents and torrents of monsoon rain pouring down. They didn’t go anywhere. Ram simply constantly chanted the name of Sita, meditating on his beloved Sita’s love, thinking of all their intimate pastimes together, and with such profound compassion from his heart meditating on what she must be going though. Feeling the pain in his own heart in separation from Sita, he knew that Sita was feeling even more pain in separation from him. But she was under the control of an evil, demoniac person that only wanted to exploit her. This was the meditation of Ram as he was sitting here in those four months. And for Laxman who loved Ram billions of times more than he loved his own life, seeing the pain of separation from Sita that Ram was enduring was causing the same pain and more to Laxman, just waiting for the monsoon rains to end. Ramchandra is Bhagvan. He is the controller of all controllers. Mahavishnu, the creator of the cosmic manifestation, Garbhadakshayi Vishnu the creator of each universe from whom Brahma is born by, are all mere expansions of expansions of expansions of Ram. Yet playing the role of a human being to perform the pastimes that will enchant our hearts, and while enchanting and attracting our hearts through the drama and emotions of these pastimes, he is teaching us the highest principles of dharma and giving us the purest example of how we should live with the greatest integrity in every situation. While they were sitting up here in Prasravan or Malyavanta, Ram would tell Laxman, “Waiting for these four months of rain to end, every moment is like millions and millions of years in separation from Sita. I am feeling helpless. We can’t even look for her in this condition.” And as we have already spoken, Ramchandra, there is a murthi inside; he is chanting on beads names of Sita and meditating upon her within his heart with such compassion. This virahabhava or virpralamba. It was that ecstasy of love in separation that Ram was feeling for Sita here in Malyavanta, and it was that same love in separation in Ashok Grove of Ravana’s garden in Srilanka that Sita was experiencing for Ram. They were together united in the most intimate way. When the monsoons ended, Laxman seeing the condition of Ram tolerating his four months, he was really eager for the search to begin, but nothing happened. The Monsoons ended, the days passed, weeks passed and Ram and Laxman are still sitting, up here in the cave. Where is Sugriva? What happened is this. Sugriva was now the king and he had all these beautiful princesses and queens and everybody else all around him. He had all the luxuries of Bali and he was in Bali’s inner chamber, enjoying like anything. He was drinking all these intoxicating nectars and he was drinking all these other things and he was eating the finest foods of berries and roots and whatever his cooks were making, and he had golden thrones and beds and silks, he was enjoying. Laxman said to Ram, “Where is Sugriva?” Ram said to Laxman, “I think he is so intoxicated by his new position as the king that he has completely forgotten about us.” Laxman was trembling with anger. He said, “I will go down and I will punish him.” Laxman walked down from the hill. He was anger personified. Meanwhile Hanumanji, he told Sugriva, “What about Ram? What about Sita? You gave your word. You should tell Nila to proclaim to all the monkeys throughout the world to come and assemble to search for Sita.” And Sugriva, by Hanuman’s mercy kind of woke up a little and said, “Yes, call them.” So the message was out. Meanwhile Laxman came down. He didn’t see anything happening and gradually more and more monkeys were assembling and they saw Laxman, so disturbed. They went to tell Sugriva that Laxman is really angry. Sugriva, he told Angad, “You go out and tell Laxman that I will meet him a little later. I can’t meet him now. Look at me!” He was in the middle of enjoying. So Angad went out and then the message came back that ‘Laxman is really angry with you.’ What was his anger? He was for four months seeing Ram’s emotions in separation and here is Sugriva enjoying all these luxuries, completely oblivious to Ram’s suffering. Ram living in a cave and he is living in the highest luxuries of the world and it’s all because of Ram that he is there. Ram told Laxman something we should always remember. He said, “The wildest attribute of human character is to not be grateful.” When we are given something and we have no gratitude that is one of the lowest most condemned states of consciousness. Being grateful is something more than just saying, ‘thank you’ and then criticizing the person. Being grateful is a state of consciousness, a state of awakened awareness. Are we grateful for every breath we breathe? For every morsel of food or water, for the ability to see, for the ability to hear, for the ability to move? If you have asthama and you are dying because can’t even get one breath, you start to value, what air really means to us. We are all just breathing thousands and thousnads of times a day with no gratitude whatsoever. But if you have an asthama attack, you would give everything you own just for some air to come into your lungs. So sometimes the difficulties of life are there to help to deepen our awareness of what’s really valuable. If you are a devotee, even at the time of death we are grateful that we are eternal souls and we are grateful that Krishna is here to deliver me at this moment. And this how we should be living with every breath of our life. He sent one fourth of monkeys, vanaras, in the northern direction and another east and west and he told them all, “I give you one month to find Sita. Go through every detail of every place. You must find her.” And Sugriva said, “I will punish you if you are not back with the news within one month.” So they all started going in different directions. And he then had Angad, Jambavan, Nila, and Hanuman; Sugriva said, “You go in southern direction because I think that’s the way Ravana was going on the airplane.” Sugriva began to speak to Hanumanji. He said, “Of everyone, I deeply believe you will be the one to find Sita, because of your love for Ram, your determination, your devotion. And on the basis of that love and devotion, your power, your intelligence, your determination, I am sure you will find Sita.” Ram heard this and was so pleased by Sugriva’s words to Hanuman. Ram approached Hanumanji and said, “Of all these devotees, I believe because of your devotion, you will find Sita. To give her confidence that you are truly my messenger, give her this ring.” Ram took from his own finger, a ring with his name on it and with tears in his eyes he pushed that ring to his heart and said, “Give this to Sita and she will know. And tell her how I am in this cave crying and waiting to meet her again. I will do anything, I will destroy all the world to bring her back if necessary.” Hanuman took the ring and then Ram told Hanuman certain secrets that no one in creation except Sita and Ram knew of their intimate interactions and said, “Tell her this and she will know that you are truly my messenger and tell her my love.” Hanumanji took that ring and put it to his head and departed. I think it’s time for us to depart also. We will continue tomorrow.